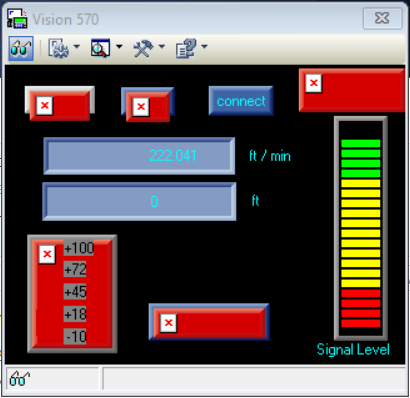 Trying to connect laptop to PLC thru Remote Access so I can view screens real-time and get screen shots for a product manual. All settings are correct, however when I press the "On Line" button, I keep getting a "Runtime error '5'" error message. Can anyone help me here??!! I'm under the gun to get this manual finished! and once i click "ok" visilogic closes. I am running 64bit windows 7 I am trying to connect to the PLC via ethernet. The PLC is V1040. I have re-installed Visilogic 9.3.0 twice as per the removal procedure in this forum with no luck correcting the issue, to make things worse this function works fine accessing the same project on a collegues computer hence I am thinking something has fallin over in my puter. What am I looking for? This is "Bugging" me (excuse the pun), as I will be required to remotely control this through the access portal in a short while. Visilogic is also warning me that it was not shut down properly and that the project should recover. I have tried to not recover and open again clean but I have this same issue. Found the cause for the error. It was down to the UA Content. Thanks to further searching on this forum. some how the UA content on my machine had been reset to default. Turning this feature off in Windows 7 has remedied this problem. Hope this assists someone else with the same issue. I agreed with the supremacy of Windows XP buy anyway is not "Runtime error" a lack of debbuging in the Visilogic software? I said that after to reinstall Visilogic again because of "runtime error 91"
Running Windows 7. I had a runtime 5 error, in visilogic and remote access. I disabled UAC in Windows 7, everything works great now. Hope this helps someone. Hi, sorry for replying to such an old post but I am having similar issues (Get OPLC information works but when trying to get on-line I get the runtime error '5' message) on Windows 10/64 bit Using Unitronics Remote Access v 9.8.10. Disabling UAC (setting it to "Never notify") did not help. Luckily running the program in Windows XP compatibility mode did fix the issue. However, some of the elements are not being displayed and instead show a red "X" (like temperature gauge displays but even simple buttons, see screenshot). Are they incompatible with Win 10 or do I simply need to download them? If so, what and where? Did you create a Fonts and Images file from the PLC and then select it to be used? I'm sure Flex is on the right track, but if not, then I would also be trying something really off field. And also keep it in mind forever as well. W10 has dropped many abilities in the Compatibility settings, and I had similar nightmares on a heap of older ( and not so old ) programs in getting them to display things correctly. Really dumb stuff like some, but not all, control buttons in my CAD program appearing upside down, sideways or not there at all! The solution is that the missing controls still work, you just have to do registry entries to make it so...another case of "the genius gang at Msoft has done it again!!" In my case, the relevant thing that no longer appears in W10 was "Disable visual themes". "C:\\Program Files\\*****Master folder name if there is one*****\\******Second folder name if there is one etc etc*****\\name of exe.exe"="~^ DISABLETHEMES DISABLEDWM RUNASADMIN WIN98 "
The C path needs to be correct. If you have already done a compatibility setting then you will likely find an entry here already. You just need to add in the DisableThemes bit. Note in my example the other controls that I have in place as well.....run as admin, as W98 etc. If you get this right, and it is indeed the problem, magically everything will come back to normal. It is simply amazing to see it happen from such a small registry entry, when you have been lead to believe that all your expensive programs have been reduced to pieces of garbage....and you need to update....often to something that doesn't do your particular job anywhere near as well.